Walking back from my tailor’s today, I started to think about my suit. Not the one I’m having made up, but the one I’m wearing now. It was made for the incomperable Mrs. E’s paternal grandfather by Gieves & Hawkes of Savile Row. It’s made of heavier wool than we’re used to wearing now and so makes up and drapes beautifully. It’s a three piece, side-vented suit (lapels on the vest), three-button rolling to the second. The lapels are narrow — 2 1/2″. It was made in 1966. And it is a sober, businessman’s suit. It is a dark grey. I love grey suits. And I think that most men who wear suits do too. I only wish it were flannel. 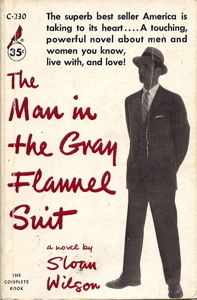 Although it was associated with the “corporate man” of the day (and became a sort of scarlet letter for the suit-haters), Sloan Wilson’s novel left us with an iconic figure: The Man in the Gray Flannel Suit. And I’m pleased to say, he’s back. Flannel is kind of a casual, comfortable fabric. It is soft, rather than hard finished, retaining some “nap.” Today’s grey flannel suit is apt to follow the trend toward a slimmer fit suit with a peaked lapel. It can be found in traditional three-rolls-to-two button notch lapel models or made up into double-breasted numbers that look great under a camel-hair polo coat. In medium grey, you really can’t go wrong. Being a “casual” fabric, you can even pair the equally iconic Brooks Brothers button-down shirt and a striped tie with the single breasted models. (You could do this with a DB, but really only if you realize you’re breaking “the rules.”) Set off by a pair of brown suede shoes, flannel really comes into its own. They, too, were considered “casual” back in the day. This entry was posted in Elegantology and tagged books, clothing, Elegantology, flannel. Bookmark the permalink. The Average Guy's Guide to Style. ©2016 Easy and Elegant Life. All Rights Reserved. If you would like to reprint an article or repurpose a photo, please email me for permission. That’s What To Do With a Knit Button-Down Shirt!